Take a voyage to the Africa’s most stunning and spectacular historical landmarks―Lake Victoria! Located in the east central part of the country and sharing borders with nations like Tanzania, Uganda, and Kenya; Lake Victoria was first discovered by a British Indian Army officer John Speke in the year 1858. Also known as Victoria Nyanza, the 68,800 km wide lake has dotingly derived its name from then Queen of England – Queen Victoria. In recent years, tourism activities in Lake Victoria have increased due to the improvement of infrastructure around the lake basins. Good roads, securitywithin the East African Countries side and an increased investment in hospitality industry have seen the number of tourists visiting Lake Victoria region shoot upwards. The number of world class resorts being set up in the Lake region has made the Lake transform from a traditional fishing point where most of the Islands surrounding the Lake are now dotted with private resorts, game lodges and beautiful hotels that offer tourists an atmosphere to die for! The Lake Victoria region is now one of the most popular destinations in East Africa due to its untapped island fossils sites and the general quiet and private atmosphere that offers peace and tranquility. The number of picnic sites that are coming up such as the Bridge Island and Rusinga fossil sites (In the Kenyan part of the Lake) where the oldest skull was found by renowned archaeologist Dr Leakey and indeed the beautiful Lake itself, which is a great game fishing point. Lake Victoria Africa as of now has more than 170 tourists sites and a quite a substantial number of heritage sites that outnumber other tourism circuits thanks to the 50 world class resorts set up along the Lake and the many Islands surrounding Lake Victoria. Parks such as: Musoma, mountain gorillaTanzania: Lies on the east shores of Lake Victoria Africa and is located near the Kenyan Boarder. Tourists will enjoy the cultural and vibrant life of the local people. The views of the lake feature many varieties of boats, from large ferries and transport barges to ngalawa fishing boats and dugout canoes. Bukoba, Tanzania: Lies on the Western show of Lake Victoria Africa and has all year round sunny and warm climate. Has friendly people and a rich cultural history that will leave you with enough knowledge about Tanzania and indeed the whole East African Region communities. Lake Victoria has a great wetland surface that offers birdwatchers and lovers a wonderful expedition where they can watch the island fish eagles running a spectacular scene diving way from above the sky into the water to catch their prey. There are a number of birds that come to nest here and rear their young before they embark on the long Journey across the Indian Ocean. Bird watchers will be thrilled by the many bird species found on the Lake Basin. Different hotels, lodges and resorts organize game drives for their clients. Alternatively, tourists can liaise with local tourist companies and hire a guide to take them around the Lake Victoria region and benefit from seeing some of the wildlife in the area and how they co-exist with human life. Ngamba Island is commonly referred to as Chimpanzee Sanctuary. The Sanctuary was founded on October of 1998 to care for orphaned Chimpanzees rescued by Ugandan Wildlife Authority from poachers and traders out to make money from their spoils. The Island covers an approximate 40 hectares (100 acres) of rainforests 23kms from Entebbe near the Equator in Lake Victoria in Uganda. 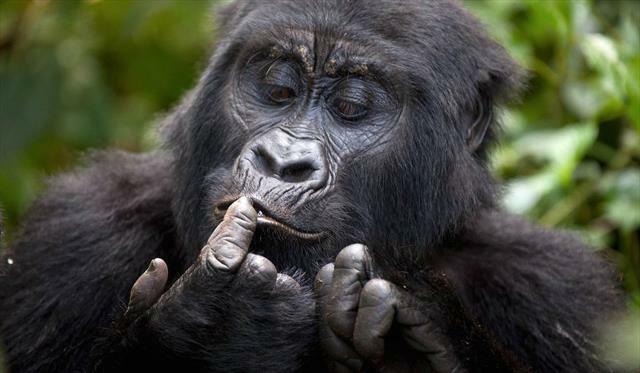 Ngamba Island consist of over 120 bird species, crocodile, hippos and monitor lizards. The Island provides sufficient foods in varieties for the chimpanzees. The Island was designed as an eco-friendly project that consists of compost toilets, rainwater collection. The Island has been set up with proper waste management practices and a solar system set up providing electricity and hot water. When a new and youngchimp is brought to the island, it is separated from the adults. The newchimps are protected from a rowdy group of older chimpanzees that is rough to strangers. As is per the norm, new arrivals are kept in a large cagewhere they are visited by a few adult chimpanzees come in to form friendship with the new chimp. Travellers to Ngamba Island are privileged enough to watch and see the great apes in their natural habitat however living in captivity as Ngamba Islands fore care and rehabilitation. To guarantee their safety, the chimpanzees secluded in an area of the island where they roam freely in the forest. A fence keeps the great apes in the secluded area; they are however fed two times each day from the viewing platforms. Visitors wanting to visit during the day or spend a night and have the chance to walk with the chimps in the forests can request for an arrangement to be made. Walking with chimps, having them not only play but bite into your hair is a wonderful experience. Travellers are asked to have been immunized properly to be able to walk with the chimps. For immunization, check with World Primate Safaris before booking. Smart self-contained tents overlooking Lake Victoria offer Accommodation on the Island. Bulago Island is set on a location covering over 500 acres. Measured from one tip to the other the island is approximately two miles long. The island has a totally of 6km sandy beaches and the shoreline is 10km in length. The shoreline balances consists of low cliffs and rocky outcrops. The soil around the shore is rich in minerals and there are places covered with trees. On the north-eastern tip of the island there is a piece of land covered by a rainforest. Bulago Island offers one of the great pleasures of sheer range and diversity of walks. The island has two overlooking hills on the island offering viewers staggering views. The island’s size allows visitors to either take short quick strolls or enjoy long treks if they so wish to. Banda Island was privatized a while back. The Island however opened its doors to travellers for the first time in 1999. Banda Island is serene, quiet and appealing to all kinds of travellers. Here we provide you with the ways and means of getting to this magnificent island. Bugala Island is the largest of the Ssese Islands on Lake Victoria, with an area of 67,000 acres. This Island is the best developed for tourism and is easy to travel to by ferry. On the western end of Bugala Island lays a small village, Luku, not far from Mutumbula swimming beach. It is possible travel to Luku through a dirt road and the other villages on the south of the Island are accessible via several minor roads. From Kalangala you can’t hire a bike and travel to each of the villages. The Island is hilly so it will also offer some spectacular scenery on your travels. Bugala Island is also teeming with wildlife and contains many birds that can be seen or heard. Monkeys are also common and if you travel to the south of the island, there is a swamp that contains hippos. There are two ferries that travel back and forth from and to Bugala Island. The first one runs from Nakiwogo Dock (south of Entebbe) to the ferry dock at Kalangala. The second travels from Bukakata (near Masaka) and lands in Luku. There are less options for accommodation if you take the ferry to Luku so it would be recommended to take the ferry to Kalangala. For accommodation one of the places you can stay is Hornbill camp, located east of the dock. From here you have the option to hire a kayak or motorboat. You can enjoy a peaceful and cheap stay here and while you relax you will be able to listen to the birds and watch the monkeys as they run around. There are many other relaxing resorts in Bugala which include Pearl Gardens Beach Resort, Bovad Sands Lodge, Panorama Cottages and Ssese Habitat Resort. The only outflow from Lake Victoria is the Nile River, which exits the lake near Jinja, Uganda. In terms of contributed water, this makes Lake Victoria the principal source of the longest branch of the Nile; however, the most distal source of the Nile Basin, and therefore the ultimate source of the Nile, is more often considered to be one of the tributary rivers of the Kagera River (the exact tributary remains undetermined), and which originates in either Rwanda or Burundi. The uppermost section of the Nile is generally known as the Victoria Nile until it reaches Lake Albert. Although it is a part of the same river system known as the White Nile and is occasionally referred to as such, strictly speaking this name does not apply until after the river crosses the Uganda border into South Sudan to the north.